Yesenia Velasquez at PACCAR Hall on the University of Washington campus. Pre-college programs and undergraduate organizations can help students discover their place in the world. 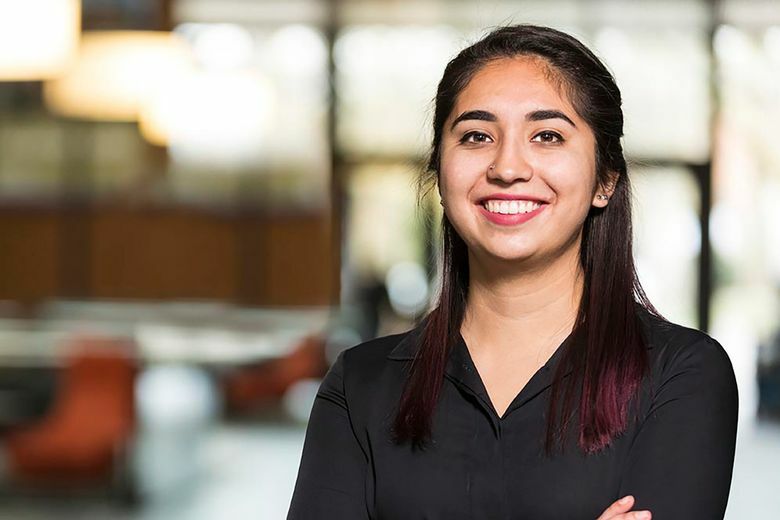 University of Washington senior Yesenia Velasquez’s parents immigrated to the Yakima Valley from Mexico before she was born. To make a life in the United States, they worked hard at thankless jobs, from forging bricks to packing produce. But they wanted more for their three daughters. Growing up in a working-class Hispanic community, Velasquez saw most career possibilities as abstract at best. No matter how well she did in school, college looked no less expensive or intimidating. Then she discovered the Young Executives of Color program at the University of Washington Foster School of Business. A partnership between the Foster School and the professional services firm EY (formerly Ernst & Young), YEOC is a nine-month program that provides an introduction to business careers, professional development, college preparation and mentoring to some of the most promising high school students from underrepresented minority communities around the state. For Velasquez, the YEOC program was the missing link that showed her how and where she could apply her talents. Hearing stories from each session’s featured speaker — senior executives who look like and come from the same backgrounds as the students — she began to visualize what she could become. Then she took her next step toward her future by enrolling at the University of Washington. As an undergraduate, Velasquez has taken advantage of the many student programs available on campus. In addition to serving in student leadership, she presented at a national case competition and studied abroad. And thanks to YEOC, she also landed an internship at EY after her first year on campus. In addition to YEOC, the University of Washington offers a wide network of programs that support young people on their journey to — and through — higher education. The Husky Promise, now in its 10th year, covers the tuition and regular fees of Washington students who qualify. So far 39,000 students have received this support, and the UW has committed to remaining affordable and accessible for Washington residents as they pursue their Husky Experience. What doors will the Husky Experience and the Husky Promise open for you? Visit admit.uw.edu to learn more.